EurekaFacts, a full-service market and social research firm, is conducting in-home safety surveys in locations across the country, on behalf of the U.S. Consumer Product Safety Commission (CPSC). EurekaFacts is doing an in-home (and phone) study to evaluate the usage and functionality of smoke detectors and carbon monoxide (CO) alarms nationwide. This is the first-of-its-kind study in more than 25 years. The purpose of this survey is to inform CPSC about the usage and functionality of smoke detectors and CO alarms in homes in the United States. Input from survey participants will assist in the development of standards and guidelines that will help protect property and human life, and improve household safety across the United States. is at the center of this important research and local public safety campaign. to gauge the functionality of smoke and CO alarms in communities like yours. The surveys will be conducted in 24 metro areas over the course of the next 9 months. EurekaFacts will conduct 1,185 interviews with about 10% done by phone. All in-home interview sessions will last up to 60 minutes, and telephone interviews, for those without alarms or who have central security systems, will last up to 20 minutes. The in-home survey requires two-member teams (a survey interviewer and an alarm tester) to enter homes to ask questions about household fire safety and to test smoke and CO detectors to make sure they work. Typically, the team consists of two local firefighters, but may include other trained volunteers. 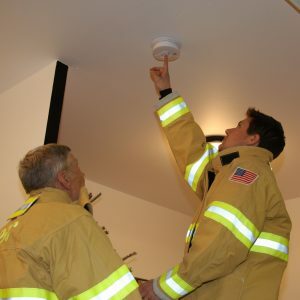 A member of the team who is trained and certified to inspect and install smoke detectors will test the smoke and CO alarms to see if they are working. If the batteries in the detectors need to be replaced, the team member will provide a replacement battery for free. If the survey team, during the in-home interview, finds any detectors to be non-functioning, new ones will be offered at no cost. For people who rent their homes, EurekaFacts will need to contact property managers to discuss arrangements regarding the survey team visit and smoke detector testing. In instances where participants may not have any smoke or CO detectors, they are still eligible to participate in the survey, but EurekaFacts will conduct the interview over the phone instead of in-home. All survey participants receive a gift card from a major credit card company in appreciation for completion of the interview. In-home participants receive a $25 gift card and any free alarms/batteries (if needed) as a result of the alarm testing. Phone participants receive a $10 gift card. If your household is selected for these smoke and CO detector interviews, an important part of the research process, we hope you are willing to participate. Read the CSPC alarm study FAQs. EurekaFacts is a full-service market and social research firm in the Washington, D.C. area. We help leaders understand and shape successful programs, communications, and brands through data collection and advanced analytics. Since 2003, we have collaborated with government agencies, nonprofit organizations, and corporations to answer their research questions and business objectives. EurekaFacts is ISO 20252 certified, the highest quality standard in market and social research. The Consumer Product Safety Commission is charged with protecting the U.S. public from unreasonable risks of injury or death associated with the use of the thousands of types of consumer products under the agency’s jurisdiction. Deaths, injuries, and property damage from consumer product incidents cost the nation more than $1 trillion annually. CPSC is committed to protecting consumers and families from products that pose a fire, electrical, chemical or mechanical hazard. CPSC’s work to ensure the safety of consumer products – such as toys, cribs, power tools, cigarette lighters and household chemicals – contributed to a decline in the rate of deaths and injuries associated with consumer products over the past 40 years.